I wanted a few things when I came up with this. I wanted it to be easy to assemble, yet not look horrible if someone saw it. It had to hold a minimum of 4 ski's, plus poles. With this in mind, I decided to make the whole rack 48" wide, since this was very easy to cut for me. This worked out to holding 5 pairs of ski's and poles. This design places the ski's 8.25 apart, leaving plenty of room for bindings. Cut the 2x4 into a 48" long length. Keep the best looking side, and set the other piece aside. Cut the .75" dowel into pieces. 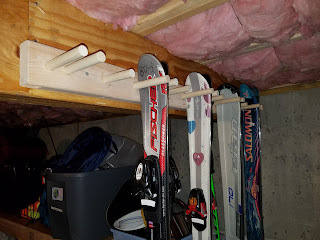 I used 6" pieces for the ski's, and 5" pieces for the poles. Using the Template (Page 2 of the linked PDF), line it up on the left side of the 2x4, and mark hole #1, #2, and #3. Move the template, and position #2 over the mark you just made for #3, and mark the NEW #3. This will give you the spacing between each set of Ski's. Move the template, and position #1 over the NEW #3 you just made, and mark #1, #2, and #3. Repeat steps 2 and 3 till you run out of board. 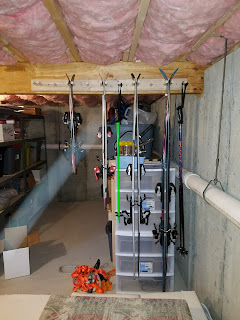 If you are making a 48" design like mine, you should end up with 5 ski's perfectly centered. Take a .75 wood drill bit (I like speed bores), and drill out the holes you just marked. Take care to have the hole straight. Test fit your dowels into the holes. Glue the dowels into the holes with a bit of wood glue. 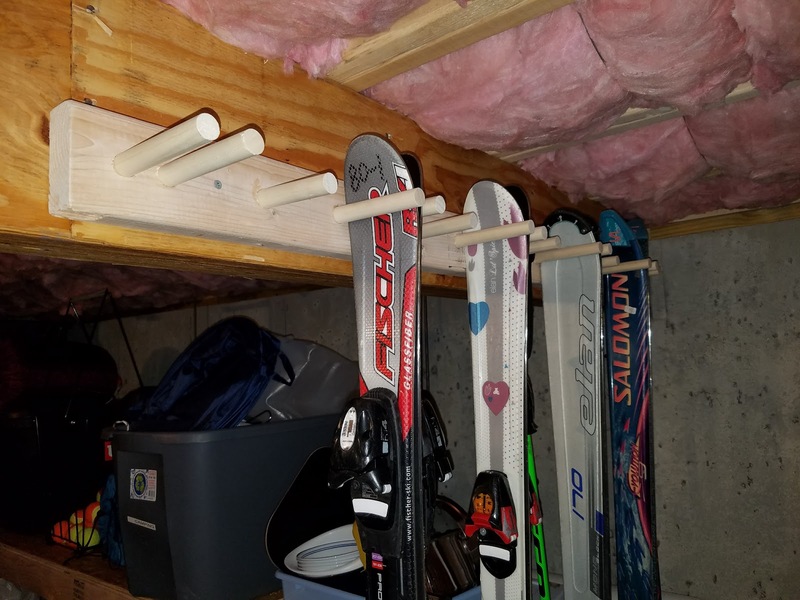 The glue does not support the Ski's, it's to keep the dowels from falling out. Drill 4 evenly spaced hole in the 2x4 to mount it to the wall. Here are some pictures of my completed rack.